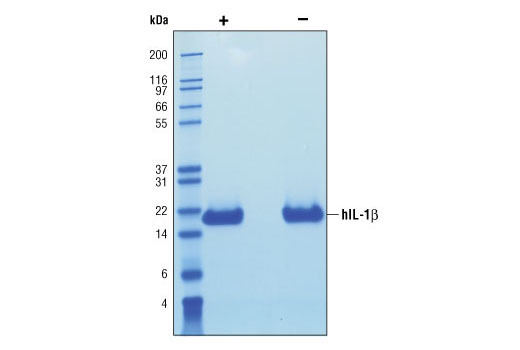 The purity of recombinant hIL-1β was determined by SDS-PAGE of 6 µg reduced (+) and non-reduced (-) recombinant hIL-1β and staining overnight with Coomassie Blue. The production of IL-8 by primary human fibroblasts cultured with increasing concentrations of human IL-1β was assessed. Media from cells incubated with IL-1β for 24 hours was collected and assayed for IL-8 by ELISA and the OD450-OD650 was determined. 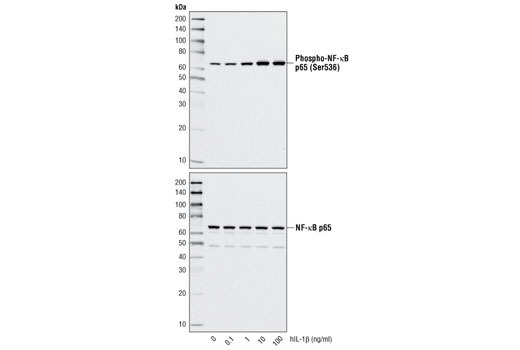 Western blot analysis of extracts from MCF-7 cells, untreated or treated with hIL-1β for 20 minutes, using Phospho-NF-κB p65 (Ser536) (93H1) Rabbit mAb #3033 (upper) and NF-κB p65 Antibody #3034 (lower). Recombinant human IL-1β (hIL-1β) Ala117-Ser269 (Accession #NM_000576) was produced in E. coli at Cell Signaling Technology. >98% as determined by SDS-PAGE of 6 μg reduced (+) and non-reduced (-) recombinant hIL-1β. All lots are greater than 98% pure. Recombinant hIL-1β does not have a Met on the amino terminus and has a calculated MW of 17,377. DTT-reduced and non-reduced protein migrate as 18 kDa polypeptides. The expected amino-terminal APVRS of recombinant hIL-1β was verified by amino acid sequencing. The bioactivity of recombinant IL-1β was determined by its ability to induce IL-8 production by primary human fibroblasts. The ED50 of each lot is between 5-20 pg/ml. Less than 0.01 ng endotoxin/1 μg hIL-1β. With carrier: Lyophilized from a 0.22 μm filtered solution of PBS, pH 7.2 containing 20 μg BSA per 1 μg hIL-1β. Carrier free: Lyophilized from a 0.22 μm filtered solution of PBS, pH 7.2. IL-1β is a pro-inflammatory cytokine produced predominantly by activated monocytes and epithelial cells (1). Precursor IL-1β is cleaved by caspase-1 and mature IL-1β is then secreted (1-3). Target cells include macrophages and many other cell types. Signaling by IL-1β involves IL-1β binding to IL-1 accessory protein (IL-1-AcP) and then the complex binds to IL-1RI (1,2). Signaling is through activation of MAP kinase and NF-κB pathways (1,2). IL-1β also binds to IL-1RII that lacks an intracellular signaling domain and thereby serves as a high affinity decoy receptor. 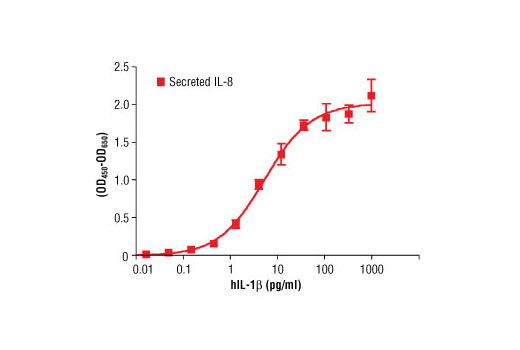 IL-1β binding to IL-1RI is inhibited by the negative regulator, IL-1R antagonist (IL-1Ra). IL-1Ra binding to IL-1RI does not signal and serves to block IL-1β signaling. IL-1β plays critical roles in the acute phase response and sepsis (1-3). Allan, S.M. et al. (2005) Nat Rev Immunol 5, 629-40. Kramer, F. et al. (2008) Mol Immunol 45, 2678-89. Cheng, H.H. et al. (2014) PLoS One 9, e88507. Kotobuki, Y. et al. (2012) Pigment Cell Melanoma Res 25, 219-30. Fischer, A. et al. (2014) Am J Physiol Gastrointest Liver Physiol 306, G218-28.